Payrolls expanded at a surprisingly robust pace in December and wages ticked higher. The data shows an American economy ending the year on a high note. But employment is a lagging indicator. Slowing earnings and trade-war risks are likely to be more powerful market motivators. Emily Harp, Human Resources Specialist for the Colorado Department of Transportation, speaks to a job seeker at the Construction Careers Now! hiring event in Denver, Colorado U.S. August 2, 2017. The United States added 312,000 nonfarm jobs in December, the Department of Labor reported on Jan. 4, the highest number in 10 months. 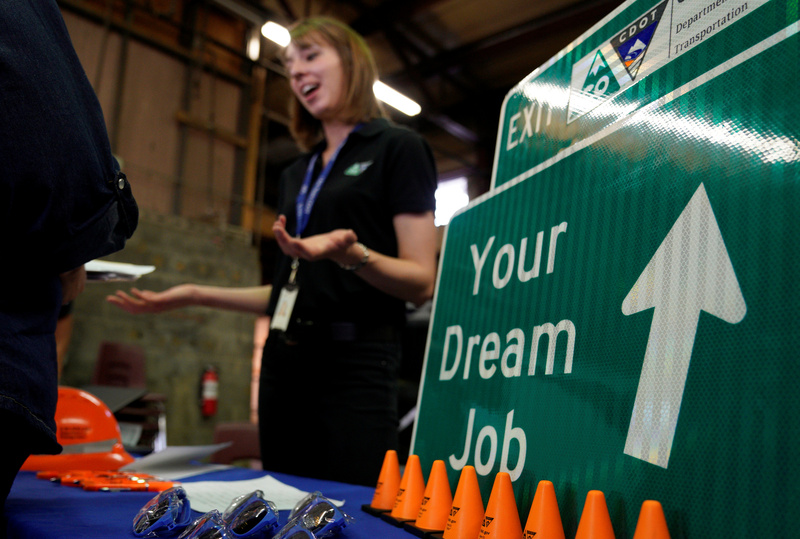 Jobs gains for the previous two months were revised upward by a combined 58,000. The unemployment rate ticked up two-tenths of a percentage point, to 3.9 percent, as 419,000 people entered the labor force in December. Job gains were widespread, with notable increases in healthcare, restaurants and bars, construction, manufacturing, and professional and business services. Average earnings in the private sector, excluding farm workers, rose by 11 cents to $27.48 an hour, leaving them 3.2 percent higher than a year earlier.